Sgt. 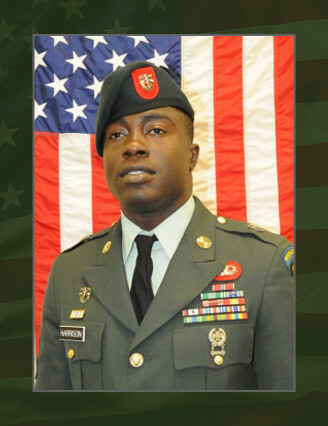 1st Class Calvin B. Harrison, 31, was killed Sept. 29, during a combat operation in Uruzgan Province, Afghanistan. He was a Special Forces medical sergeant assigned to Company A, 2nd Battalion, 7th Special Forces Group (Airborne). served with the 4th Psychological Operations Group (Airborne) at Fort Bragg, N.C., as a psychological operations specialist. “Green Beret” as a Special Forces medical sergeant, 18D. He was then assigned to the 7th Special Forces Group (Airborne), also at Fort Bragg, N.C.
and Escape Course. Harrison’s awards and decorations include the Bronze Star Medal, Army Commendation Medal, two Army Achievement Medals, Army Good Conduct Medal (third award), National Defense Service Medal, Kosovo Campaign Medal, Afghanistan Campaign Medal, the Iraq Campaign Medal, the Global War on Terrorism Expeditionary Medal, the Global War on Terrorism Service Medal, Noncommissioned Officer Professional Development Ribbon with numeral three, Army Service Ribbon, Special Forces Tab, Combat Infantryman Badge and Parachutist Badge. He was posthumously awarded the Bronze Star Medal (second award), the Purple Heart and the Meritorious Service Medal. Harrison is survived by two daughters, Azalia, Eleanna, and his parents, Jack Washington and Betty Harrison of Cleveland, Texas.